Geysir geothermal area in Haukadalur is located in South Iceland, about 110 km from the capital, Reykjavik and 50 km from the sea, at approximately 100 m altitude. Geysir is the most famous "Geyser" in the world. It was well known internationally before the geothermal areas in New Zealand and Yellowstone. Hot springs have been known in the area since 1294. The area around Geysir in Iceland has many hot springs, with many of them geysers. Geysir is alkaline with a pH of 8.0. The dome around Geysir has been built from precipitation of silica. Geysir is an irregular geyser. The timing and heights of eruptions are variable. The geothermal field lies in a shallow valley and is elongated in a north-south direction. The Geysir hot spring is situated at the bottom of the eastern slope of the rhyolitic dome Laugarfjall, which rises to 187 m.
The geothermal system is driven by volcanic intrusions in the roots of a now extinct central volcano. Rhyolitic rocks are found in Laugarfjall and the northern and eastern slopes of Bjarnarfell mountain. The lowlands east and south of the Geysir area are made of interglacial basaltic lava flows. The geothermal waters contain sodium chloride and bicarbonate, with a high concentration of fluoride and boron, indicating reactions with acidic volcanic rocks. The radon concentration is extremely high, 10-100 times that found in other geothermal areas in Iceland. Chemistry and isotopic composition indicate that the fluid originates from the mixing of run-off water from the Geysir geothermal field and local cold groundwater. 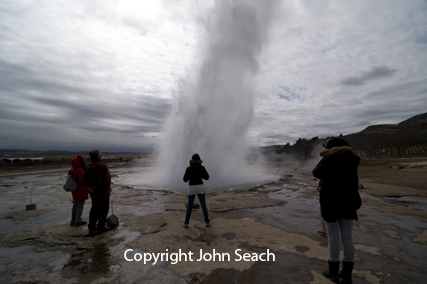 The flow rate from the Geysir field was 14 L/s in 1967 and reduced to 9 L/s in 1994. The name Geysir was first used in 1647 by Bishop Sveinson. 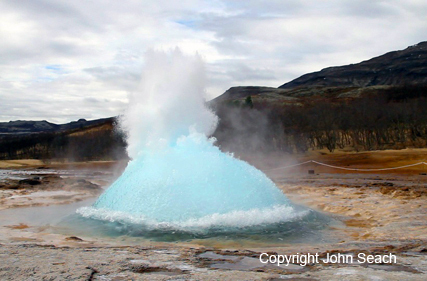 The term Geysir in Icelandic has been changed in English to Geyser for unknown reasons. In 1981 eruptions of Geysir were produced by clearing the ditch around the vent, lowering the water table, and adding soap. Geysir reactivated in 1935 by digging a ditch around the vent, lowering the water table. The woke Geysir from a period of dormancy. A large amount of soap was added to Geysir in 1907 to produce an eruption for the Danish King. Before the 1896 earthquake, the Geyser erupted infrequently, sometimes with months between eruptions. After the earthquake geysir eruption to a height of 60 m occurred up to hourly. Activity declined gradually after 1896. In 1630 the Geysir in Haukadalur erupted violently after being dormant for 40 years. No recent magmatic eruptions. Currently geothermal activity.